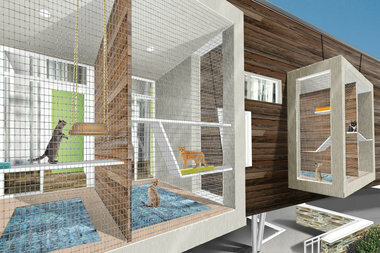 UPTOWN — After more than five years of saving, planning and researching, Uptown’s Tree House Humane Society is close to breaking ground on a new, $7 million care facility complete with a "cat’fe" that will allow people to drink coffee and hang out with the animals. Tree House Humane Society, 1212 W. Carmen Ave., has cared for some 35,000 cats and small critters since it opened in 1971. 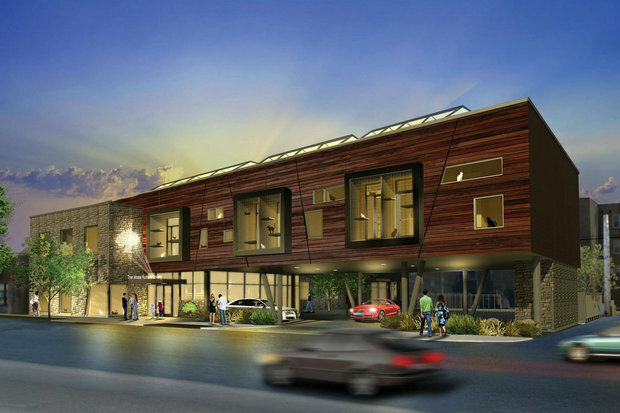 After a half-decade of gathering input, searching for donors and perfecting designs, organizers are preparing to begin construction at the group’s 15,000-square-foot location at 7225 N. Western Ave. 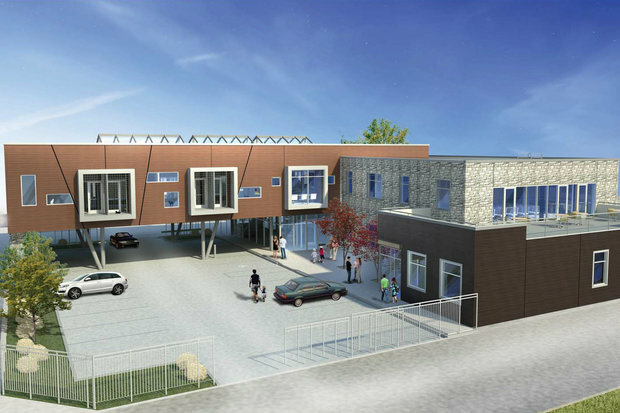 Though $2 million short of its $7 million goal, Tree House Executive Director Dave de Funiak and Development Director Jenny Schlueter said they're on track to break ground as early as next month. A rendering of an outdoor enclosure for cats to play and relax in, also known as a 'catio,' will be among the new features. 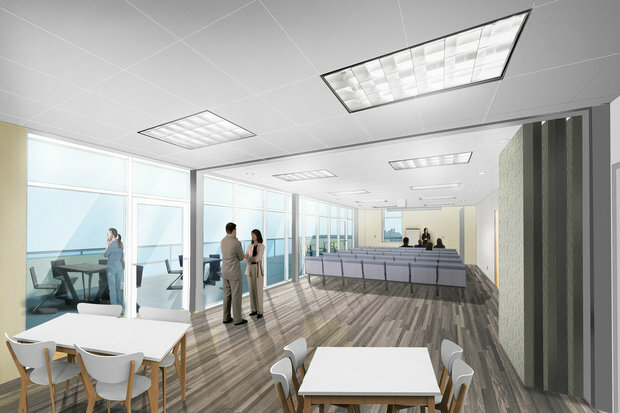 “We are probably a day or two away from selecting the general contractor, and once we do that, the [building] permits will be finalized within a matter of weeks, and then we’ll be able to break ground,” de Funiak said. 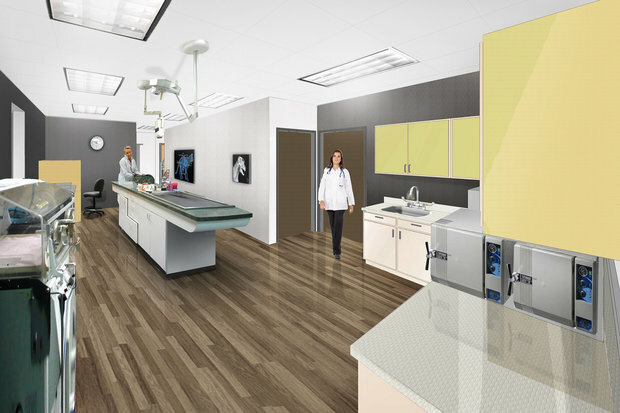 De Funiak said the initial plan was expand the organization's high-volume spay-and-neuter clinic at 1626 N. Ashland Ave. But after an anonymous donor offered land at the Western Avenue location, along with a donation toward the new facility, the group's dreams of expanding its services began to take shape. Schlueter said the new building is expected to hold about 150 cats in its shelter wing, a number she said doesn't differ much from what the Uptown residence holds now. The difference, she said, is having the space cats need to roam and be comfortable. “The point of the expansion isn’t really to increase the capacity to house more animals at one time,” Schlueter said. “It’s to increase our capacity to serve more animals and get them treated and adopted more quickly." 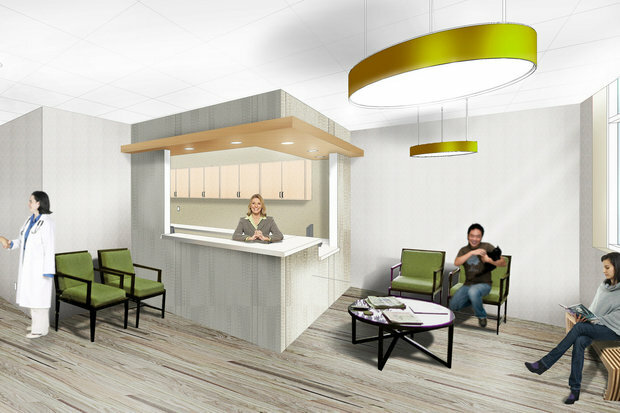 Cat’fe’: One of the most creative additions will be in the form of a general waiting area that includes coffee, tea and feline companions. De Funiak said details are still being worked out, but the cafe will be next to adoption rooms. Cats with the proper demeanor will be allowed to socialize, he said. The cafe could draw 25-30 people a day. Public Clinic: A nearly full-service veterinary clinic open to both cats and dogs. Adoption Rooms: “Sun-drenched” outdoor enclosures, rooms filled with toys and plenty of space, will be available for animals to strut their stuff for people considering adoptions. Pet Food Pantry and Supply Store: Low-income families with pets can get help in meeting their pets’ nutritional needs. The supply costs would be subsidized by the cost of other pet materials and merchandise sold to the general public. Education Center: Here, rescue, therapy and youth volunteer groups can gather to pursue pet-related causes. 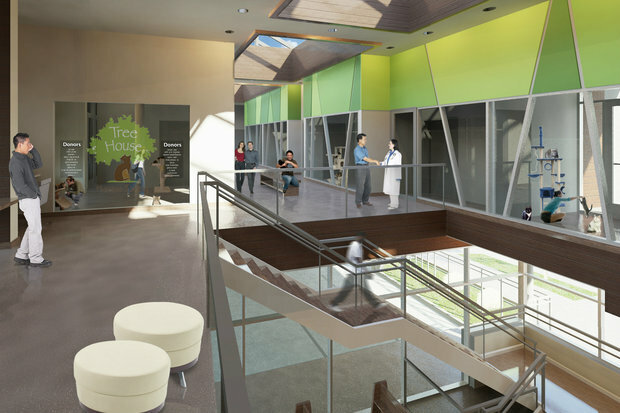 The shelter also plans to use the education center as a learning destination for training, pet grief support and more. 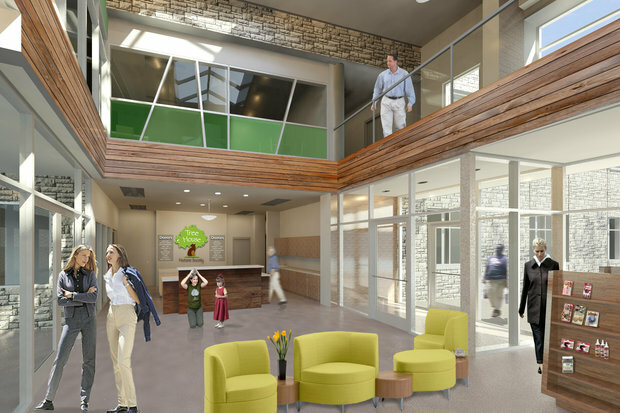 It is hoped that these additions and others will attract more potential adopters, pet owners and others to the Tree House as a "lifestyle" facility, Schlueter said. In 2014, the group was able to rescue, rehabilitate and place about 900 cats, she said. The aim is to boost that number to at least 2,000 in the new facility's first year. For that to be possible, the design and space accommodations are crucial, she said. De Funiak said they reached out to the Dobbins Group, a Chicago-based architectural firm that specializes in environmentally-friendly design. He said the new building will meet all the requirements for Leadership in Energy and Environmental Design certification — one of the highest standards of eco-friendly building — although they won't pursue the actual certification. “It’s very expensive, like $100,000,” Schlueter said. “The money we’d spend on certification could save many more animals." Dr. Sandra Newbury, a National Shelter Medicine Extension Veterinarian who serves on a number of high-level veterinary medicine panels, started as an intern at Tree House and also served as a design consultant. De Funiak said moving cats from the Carmen Avenue property to the new building will be a slow process, most likely to take place at the end of the year. Tree House workers hope to be fully settled into their new digs in 2016. Then, they'll consider selling the Carmen Avenue building, which de Funiak said he believes will need to either a gut-rehab or full demolition. De Funiak said that after next month's anticipated ground-breaking, the organization will hold a ceremonial ground-breaking event in May open to the public.